An international recognition of my art, the secret of Love and Healing symbols and a story of a miracle that will give you goose bumps!!! About three months ago I received an email from the actor Thom Bierdz. Many of you know him from from his role as Phillip Chancellor III from the “Young and Restless” and as the author of “Forgiving Troy”. Thom is also a renowned painter who has won prestigious awards. 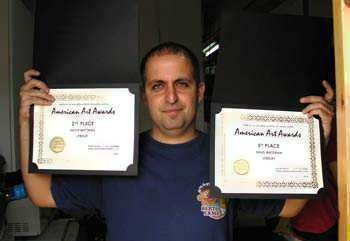 Thom is the co-founder and the host of the American Art Awards - an international competition in different fields of art. The judges panel consists of 25 established art galleries in the US. 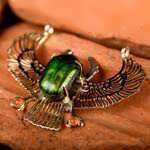 Thom asked me to participate in the competition free of charge, because he liked my jewelry art. I emailed him 6 images of different pieces though, to be honest, I didn't expect much to come of it. 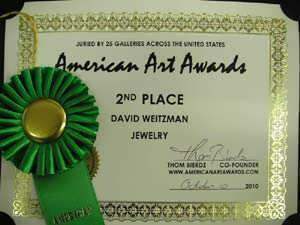 Three weeks later, I was announced as the 2nd and 5th place winner in the jewelry category! This month we have decided to run a special discount of 20% (because we celebrate the double winning) on the new products (and their other versions) and on the American art award winners. "The full potential for infinite love, for infinite wisdom, for infinite form, for infinite energy, for infinite power, for the Soul, for eternal time, for infinite velocity, for infinite faith. It has all your goals, your desires, your motivations – even life itself." 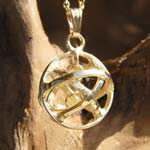 This pendant is a unique and rare combination of the Genesa Crystal, the power of love and the wisdom of Mother Earth. This is one of the best love symbols ever. It was revealed to Dvora Pearlman in 2004. 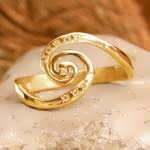 The symbol of AHAVA (the Hebrew word for love) is a perfectly harmonious symbol that can be reversed and still appear the same. It teaches our consciousness the nature of sanctified love where the creator and the created, the container and the contents together create and balance one another in perfect harmony. 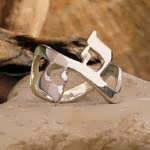 The symbol in this Ring was created from the Hebrew word for love- AHAVA". Hebrew is the holy language of the Old Testament scriptures. The Hebrew language is a language with unique and strong kinetic attributes that influence our consciousness. More than a week ago I posted a photo of the basic model for the ring on Facebook. One of the comments was from a woman by the name of Judy Robbins. This is her original comment: ”I need this ring. My spectacular son of 26 Justin returned to God on Sept 25th. I went to your web site but I couldn't find it. It is what I want for rememberance”. The post was from October the 8th. Judy’s son Justin passed away last month and so I immediately decided that I will send her the first ring that I will make from the original model as a gift. But I didn’t tell her anything yet. I want you to have the first ring that I've made from the original model. I will send it as a gift because that way it will not only remind you of the precious time you've had with Justin but also that you will always find support comfort and love on your journey. These sort of miraculous events are what really makes me glad - the basic idea that you can help and support someone who is actually thousands of miles away. 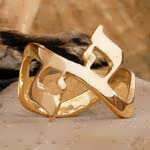 This is another great symbol by Dvora Pearlman (in a version of a ring) which was revealed to her in 2002. 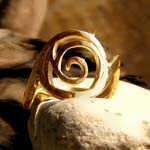 This is a great healing symbol that is meant to help the wearer achieve healing and complete recovery. 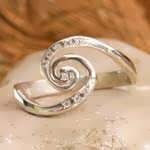 The spiral flows counterclockwise as a symbol for going back in years. 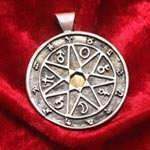 The pendant is engraved with a prayer for healing. The healing symbol is based on the language of the Old Testament and its holy scriptures – Hebrew. The symbol is constructed from three Hebrew letters –"ר" (R), "פ" (P) and "א" (A) and is the root for the Hebrew word for healing (REPHUA), that is also part of the Archangel Raphael's name. 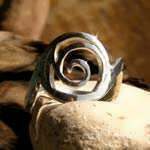 The symbol in the pendant flows counterclockwise in a spiral motion. This circular and spiral flow helps us to experience to the fullest, as well as to reconnect to the basic circle of life and creation. When this connection is made, all ailments and unpleasantness begin to open up and heal and we return to our source, to be and to live as we were originally created. Our new upcoming engagement and wedding rings section! is suitable as an engagement or a wedding ring, that I have decided to choose the best rings from my collection for this purpose. 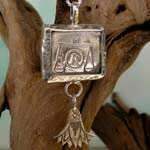 This month we made a Libra Amulet .it was created on the 12th of October between 11:34 and 12:00 noon time.